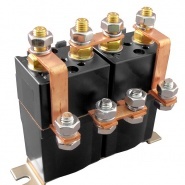 Albright International double acting series solenoids, strapped pair contactors designed for direct current loads, particularly motors used on small electric vehicles such as light industrial trucks, powered invalid cars, etc. Used for reversing DC motors, they have double breaking contacts with silver alloy contact tips, which are weld resistant, hard wearing and have excellent conductivity. All versions are available for Scheduled Maintenance or Production Run lead-time ordering. 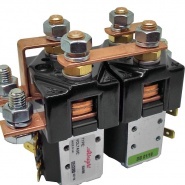 80A double acting strapped pair switch solenoids, compact motor reversing contactors. 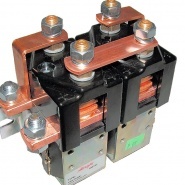 100A normally open (NO), double acting strapped pair switch solenoids, compact motor reversing contactors. 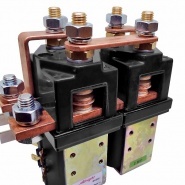 150A normally open (NO), double acting strapped pair solenoids. Motor reversing, changeover switch contactors. 250A normally open (NO), double acting strapped pair solenoids. Motor reversing, changeover switch contactors. 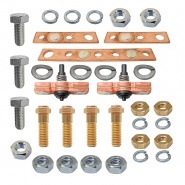 Albright SW88 series contact kit, consists of: 2 x moving contact, 4 x contact studs with nuts and washers, with silver alloy contact tips. 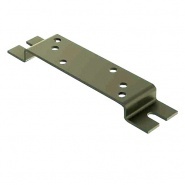 SW88 And DC182 double acting solenoid bracket, bracket for mounting Albright solenoids to panels or bulkheads. 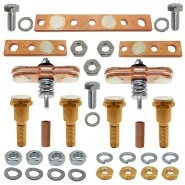 Albright SW202 contact kit, consists: 2 x moving contact, 4 x contact studs, nuts and washers, 2 x short bar and 1 x long bar contact.